During the December holidays we brought the kids to visit Muzium Sungai Lembing when we were in Kuantan. Sungai Lembing used to be a well known tin mining town back then. Since last decade the mines have been closed and this colonial building which used to house state officials has been turned into a museum. Within the museum visitors are able to learn about how Tin is formed and what items it has been made into. The kids got to see first hand how tin was collected and how a tin mine had been constructed. The boys got to see Tin in it’s raw form and how it has been polished into the pewter ware which we commonly see in shops. After spending time at the museum we came across this ride on the way back to the car. R decided to let them try the ride as it’s not available back in Singapore and would be fun for them to try out. 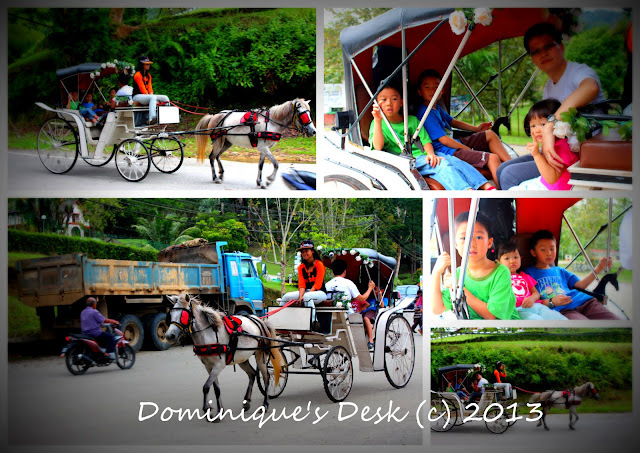 The kids loved their short horse ride and it was the first time that they have ridden in such a horse carriage. It was certainly an interesting experience for them. Join in this Wednesday for Wordful Wednesday and leave your links in the linky below.. I love the historic and learning new things such as this. I often go around the UK looking at the historic areas of the country as there are hundreds of mines, castles and ruins to look at. How very cool! Sounds like a fun day! Happy WW to you! Looks like such a neat place! I love going to the museum and taking the kids. There’s always something new and exciting to learn about! Looks like your family enjoyed the day! Very interesting place to visit. Beautiful pictures. Thanks for hosting. That looks like a really fun museum! Sounds like an interesting time! i do not know if there’s a mining museum here in the Philippines. If there is, I bet it would be a great visit. I would love to see real diamond or a clump of gold. I would love to see those things too!! We love history and museums!! Thanks for sharing! !